Toman Tool’s horn support table prevents damage to ultrasonic horns and boosters (and an operator’s fingers) by acting as a support during attachment and removal. The spring-loaded, rotating table is great for awkward or heavy horns. 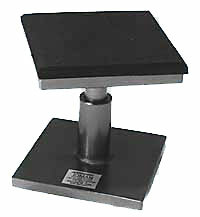 The horn rests on the table’s foam rubber top while being slid under the ram. The ram is then brought down to meet the horn. The table is then carefully turned to thread the horn into the booster. Reverse this process for damage-free horn removal. No more damaged horns or smashed fingers with the Horn Support Table!